Oh no! Bleach in my paints! 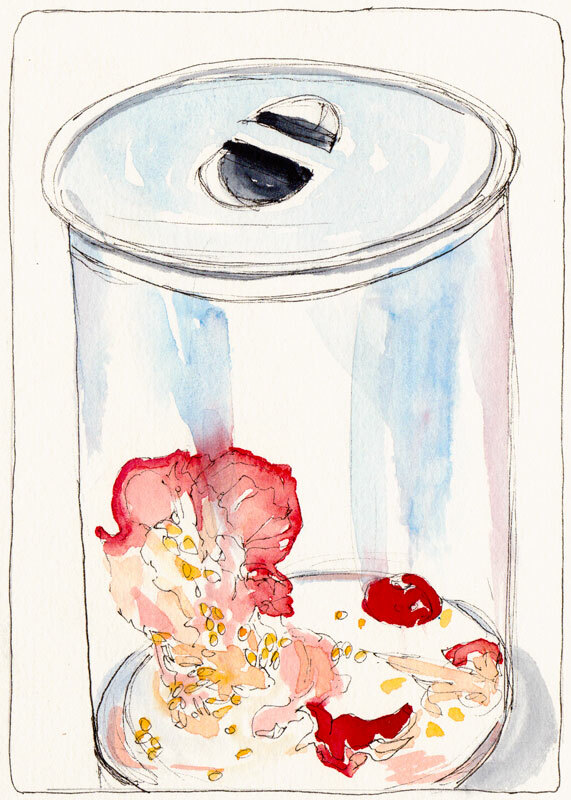 I was feeling so proud of myself for finally setting up a compost bin for food scraps and thought tonight’s red bell pepper contribution looked pretty enough to paint. After I drew the contents in ink, I grabbed what I thought was a spray bottle of water and sprayed all the colors in my palette to wet them. Then I smelled the bleach. Refusing to believe there could be bleach in there since I remembered emptying the bottle and washing all the bleach out, I sniffed the contents, and stupidly even tasted the end of the sprayer tube, convinced it must be water. Nope, it still had bleach in it and now I have the taste of bleach in my mouth, even after a cup of cinnamon tea. Finally I remembered that I’d “temporarily” re-filled the spray bottle with a bleach/water mixture again when I needed to spray something to de-germ it, and that time, hadn’t emptied it. Although I painted this sketch with the bleachified paint, I decided it wasn’t worth taking the chance to continue using the paint. I soaked my palette overnight in the sink, and then used paper towels to soak up and scoop out the big blobs of paint remaining. Oh My! So glad you have labeled that bottle now:)! Jana, I even have a Word document that makes “DANGEROUS / scull & cross-bones” type labels for all the bottles I have filled with things not-to-be-expected! Bleach is only one of them! lol. Your friend who labels pencils! Well, I printed out a bunch more labels after reading your post! I checked out my chemicals and found two unlabeled bottles! I use alcohol primarily for cleaning things, most often for removing SHARPIE from relatively non-porous surfaces. In fact, it is the propensity of alcohol to remove Sharpie that requires the use of something ELSE to mark those containers. I keep one dropper bottle of alcohol in my desk, one in my art stuff, one in the master bathroom… They all get used for removing Sharpie marks, of course, but the one in the bathroom also gets to do its antiseptic thing. lol. I pull the nose piece out of the squeeze bottle, remove the small straw from the nose piece, clean everything thoroughly (in alcohol, of course! ), let everything dry, and put whatever liquid I want into the bottle. Then I put the nose piece back into the top, put the lid on, and label. I DO use squeeze bottles for painting with watercolor. They are great for delivering exactly one drop of water someplace, much faster than using a brush to transfer water to dried paint on the palette, and great for creating small ‘bubbles’ of water on my palette so that I have a place to dip just the tip of my brush or to pull water from the bubble to the area where I’m mixing… I also use the squeeze bottle as a source of clean water when I’m in sketching mode. I bring two containers: a 4 oz squeeze bottle filled with water and a 2 oz used pill bottle (white, watertight) about 2/3 filled with clean water. I use the lid of the used pill bottle as my clean water, body of the pill bottle as my rinse water, and then I have the following options. 1) To clean a brush that is really full of paint, I often wipe first on a paper towel, then rinse (over the ground) with a stream from the dropper bottle, and THEN rinse in the pill bottle. 2) When my clean water gets dirty, I pour it into the pill bottle. This is particularly useful in places where I can’t just dump water on the ground. Also, when I’m particularly ‘down,’ I often use my dropper bottle to ‘water my palettes.’ Sort of soothing. I open them all up, put them on flat surfaces, and add water drop by drop until the paint has become soft again. (The only paints that never get this treatment are the St. Petersburg / White Nights / Yarka set. They never get really dry. Also M. Graham, with its honey, never really dries out on my palette.) This is especially useful if I want to paint with the Cotman pan paint set … when the pan paints run out, I will replace them with DS allowed to dry in the pans! The Cotman pan paints just dry VERY hard and often take 2 or 3 rounds of watering before they become useful. What a story… thanks for the tip to label things… I just ordered a new palette and you got one for free and a little elbow grease! Hopefully you didn’t have to wash too much paint down the sink! Well, this is a lesson all your readers can learn from now! Well I like the sketch. And you definitely made lemonade out of your lemons! Wow, there is a real lesson here. I am glad you shared this! I am awful about not labeling anything. As Levonne, said you did make lemonade from lemons! omg I licked my finger spilling vinegar but tasting to see if something is bleach eeeew. I hope the taste has now gone and the sinkk is still white. I agree – Oh no! Like Gillian, I first thought it was bleach in your pants, not paints. What an ordeal, glad you remedied it for next time! More disturbing than the bleach, is that your compost container appears to be a see-through container. The inside of a compost container is not something you will want to be seeing!